Much of what is interesting in Siegel’s work can best be represented in ellipses, three dots that act as stand-ins while we struggle to find the words for how it makes us feel. Other writers before me have turned to Freud for help in describing her work, but not even the father of psychoanalysis can adequately put the feeling into words. The closest he came was Unheimlich, or uncanny. But “uncanny” is a catch-all, something that gathers all these feelings into a single basket. One glance across these works shows us that the breadth of emotion they represent might fit under the uncanny umbrella, but not one is precisely akin to another. She might be working in figurative ceramics, far from the traditional Japanese techniques that were popular in Western Canada at the time of her education there, but this doesn’t mean Siegel isn’t constantly thinking about the material––she’s not a conceptual artist, after all. She explains the elements involved in arriving at a finished bust, and as a person who hasn’t made anything out of clay since my after school ceramics class in Middle School, the lesson in material was very welcome. The variables of working in clay are multifaceted and difficult to master. You start with the clay’s natural color, but you can add slips (what might be akin to priming a canvas), glazes and underglazes with varying pigments (and the potential to layer them), and can fire pieces at different temperatures, all of which affect the way a color manifests itself on the object’s surface. This technical stuff serves a larger existential purpose, of course. By knowing how these elements interact, Siegel is able to achieve an effect of translucence on her surfaces––a there-but-not-there feeling that is akin to the states of mind her figures evoke. To see the pigment in the top layer of glaze activate a lower layer of color, all the while obscuring it, is the aesthetic equivalent of confronting the emotional ambiguity contained in these faces, to immediately feel something, and then to second guess that feeling as we try to put it into words. In some ways this is another type of fragmentation, a containment of meaning in interaction (in this case, an interaction between colors), not in the thing itself. In this same way, these works do not exist except for in relation to their viewer. They are made with others in mind, as if already in a “pose of response,” as Siegel puts it, inviting emotional engagement from their audience. 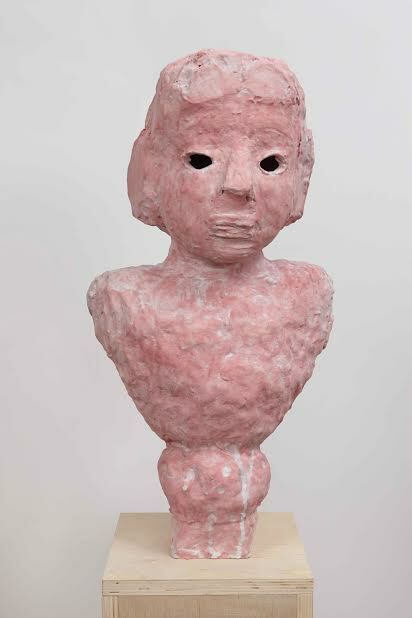 While her busts certainly don’t evoke a Higher Power in the way the Holy Shroud or Japanese dogū might, Siegel’s work acts as an elegant reminder that objects still do have the power to make us feel something––whether it be art or Alexa, given the right conditions we are willing to suspend our disbelief and interact with something as if it is more than what it is. More on Elise Siegel here.